I named one of my modular keyboards "nori". I did some googling and found a fascinating story. The modern Japanese nori industry venerates a British scientist for her discovery about the life cycle of a specific algae. The Japanese applied this knowledge to greatly improve the farming of algae that becomes nori. Having eaten nori in some form or another most of my life, this story surprised me. If you are in the UK, the BBC broadcast a program about the relationship the Japanese have with her. Ars Technica published an article about "How an unpaid UK researcher saved the Japanese seaweed industry". Musubi with green soldermask 'nori'. I bought these before but they stopped showing up on Aliexpress. Both are now back in stock. 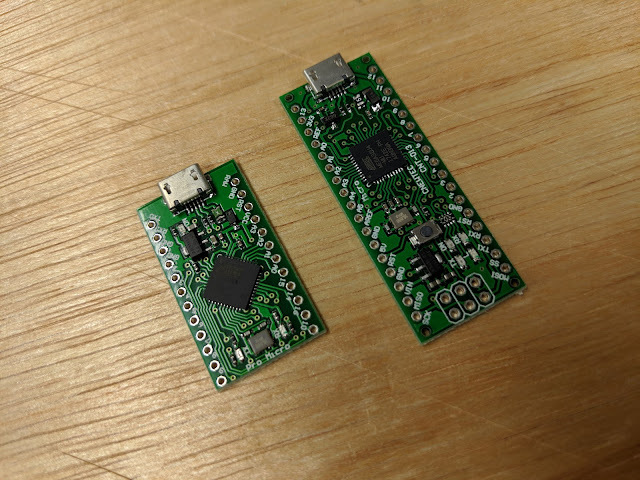 The Pro Micro clone is not an exact copy of the Sparkfun Pro Micro. 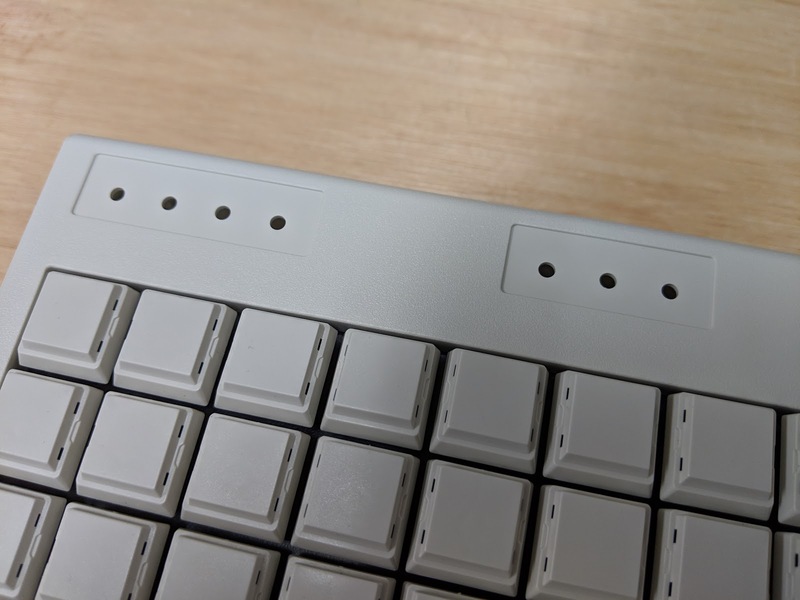 It will not work properly in many split keyboards. The green Arduino Micro clone is also different than the genuine Arduino Micro. In many ways it is better since it is thinner and has components only on the top side. It also has a Micro USB connector instead of Mini USB. You can find the green Pro Micro by searching for BTE17-05. The green Arduino Micro clone is listed under CNT-013. They do not come with any headers. Just the board by itself. Everything fits as with the normal GNAP! 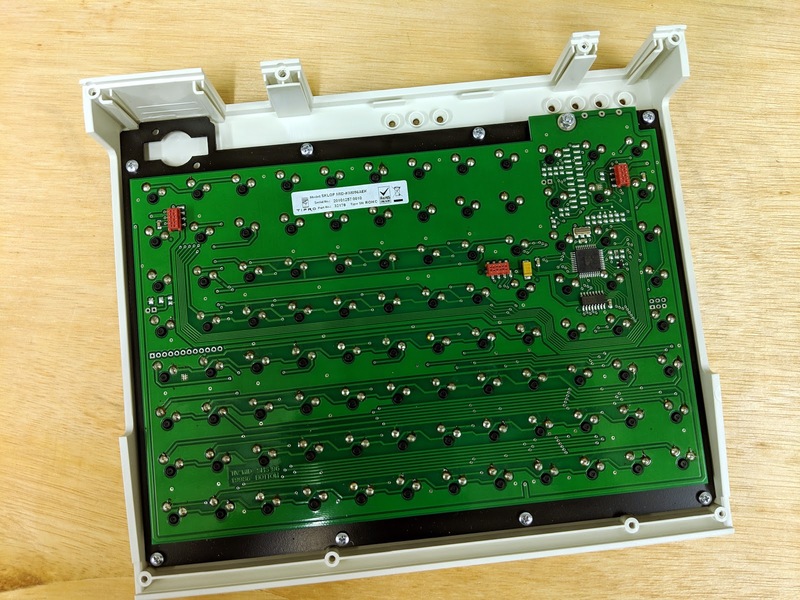 PCB. 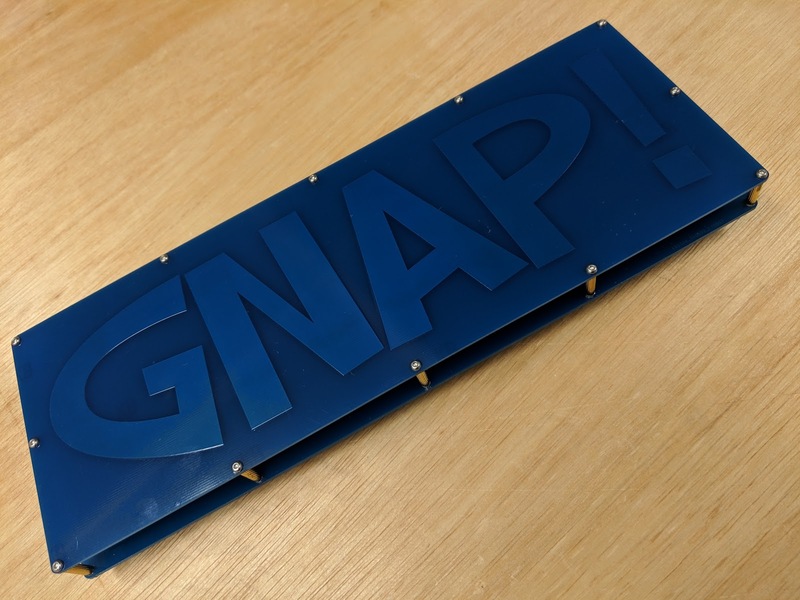 Blue solder mask GNAP top plate. Clicky box switches. 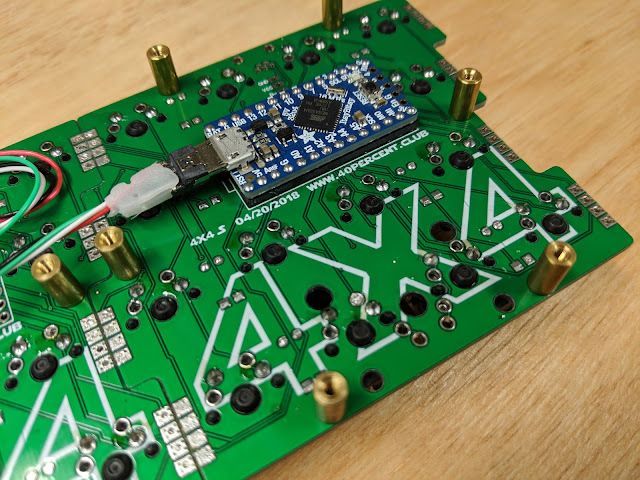 GNAP 4x4 PCB's with Arduino Micro clone. Held together with M2 spacers and standoffs. 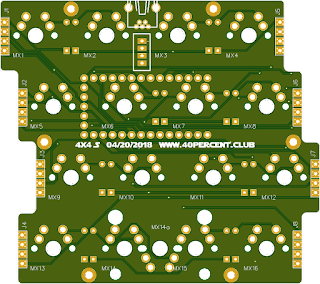 First PCB I have designed to use the Adafruit ItsyBitsy. 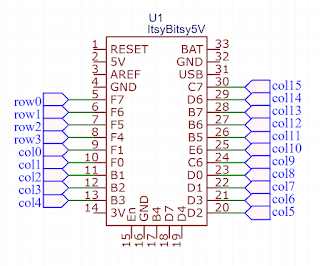 This is the ATmega32u4 5V 16MHz version of the ItsyBitsy. They also have a 8MHz version as well as ARM M0 and M4 based ItsyBitsy, the firmware I have is written for the 16MHz ATmega32u4 version. 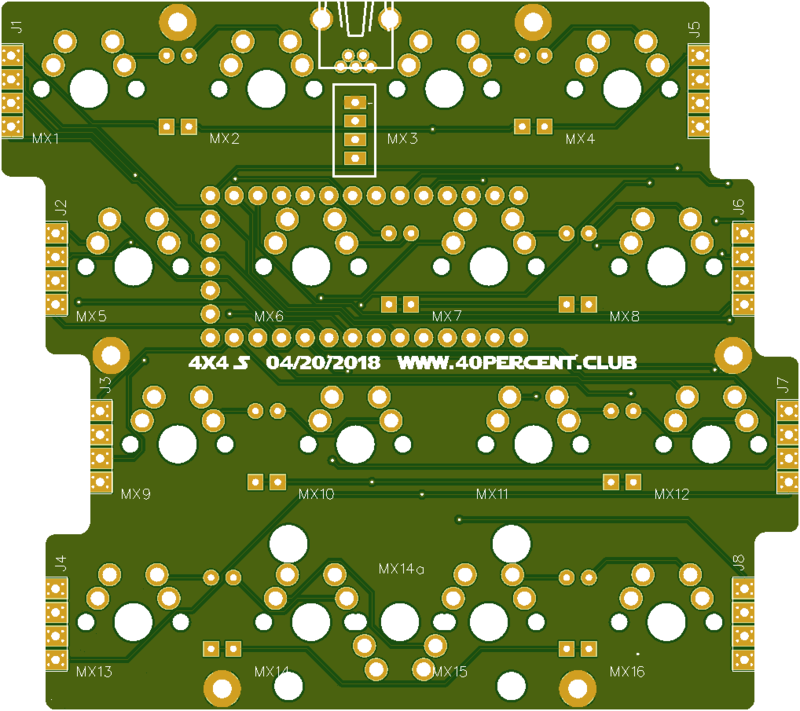 The matrix is the same as the previous 4x4 PCBs, but this time it is staggered. 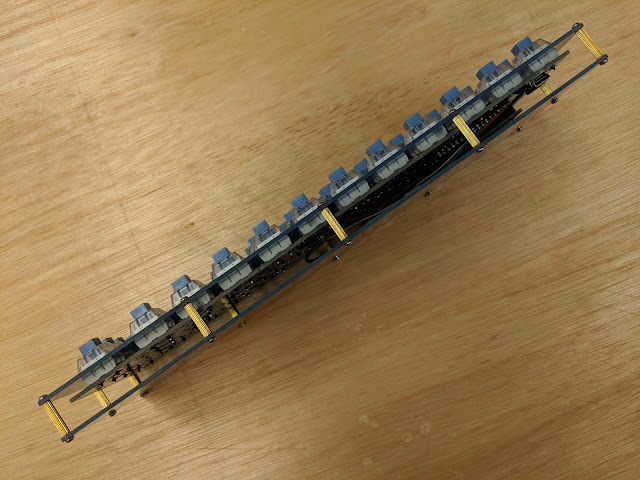 It is as close an approximation to a GNAP as I could make that would be modular, using all 1u keys. The firmware is the same as for the 4x4, only the pin mappings have been changed. Gerber files on github. 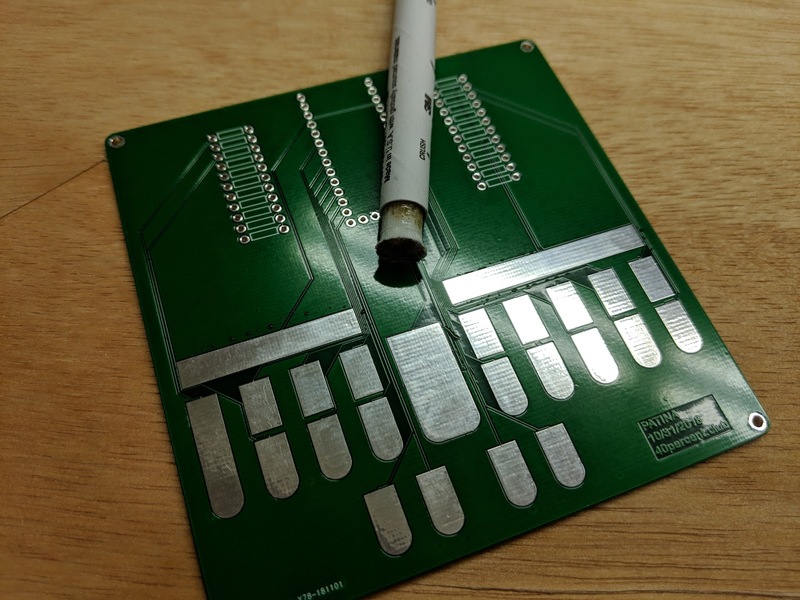 The individual PCB's are under 100mm square and are cheap to have produced. 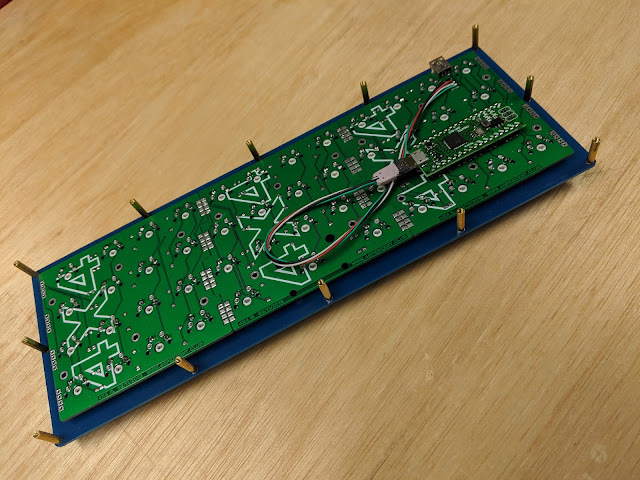 The assembled board using 3 PCB's. 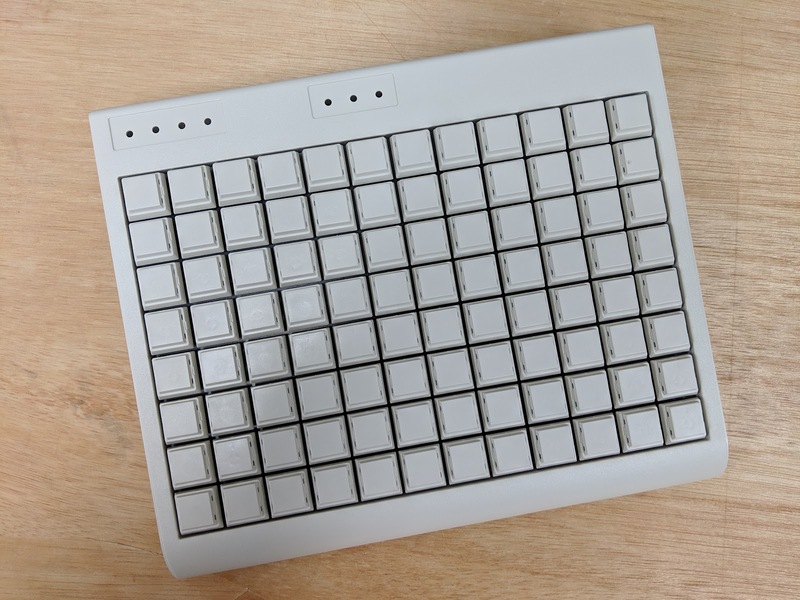 The center two switches can be replaced with a single switch and a 2U Cherry PCB mount stabilizer. The bare board. You can see the solder bridges that hold the boards together. 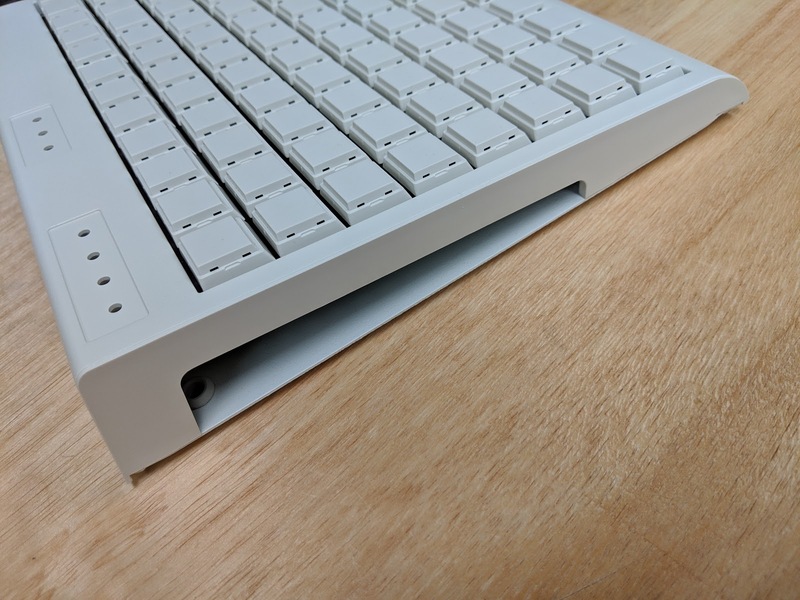 Also the 2U stabilizer for the space bar. The ItsyBitsy is mounted on the left most board. The Mini USB connector can be placed on any of the boards, with the pigtail connecting it to the ItsyBitsy. Close up of the ItsyBitsy. 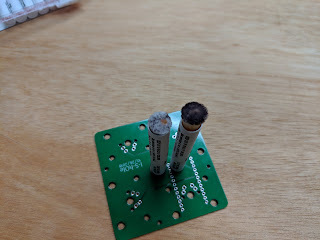 I am only using the pins along the edges of the board. The ItsyBitsy has the same bootloader as a ProMicro and you flash it the same way with AVRDUDE. It does have a tiny reset button which makes things a little easier. 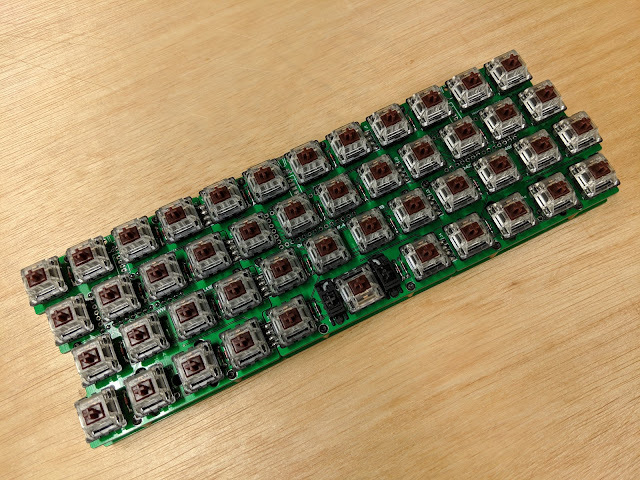 I used another set of 3 PCBs solder together as the base of the keyboard. M2 spacers and screws hold the top and bottom together. It is possible to connect 4 boards together. I have tested the circuitry, but did not build it. Doesn't look like it includes the parts for in switch LEDs (MOSFET and resistors). Also you would need switches and keycaps, which they also sell in their store (Translated). Found these for cheap on eBay. New old stock. They look like they were meant for an OEM to integrate with some other system. 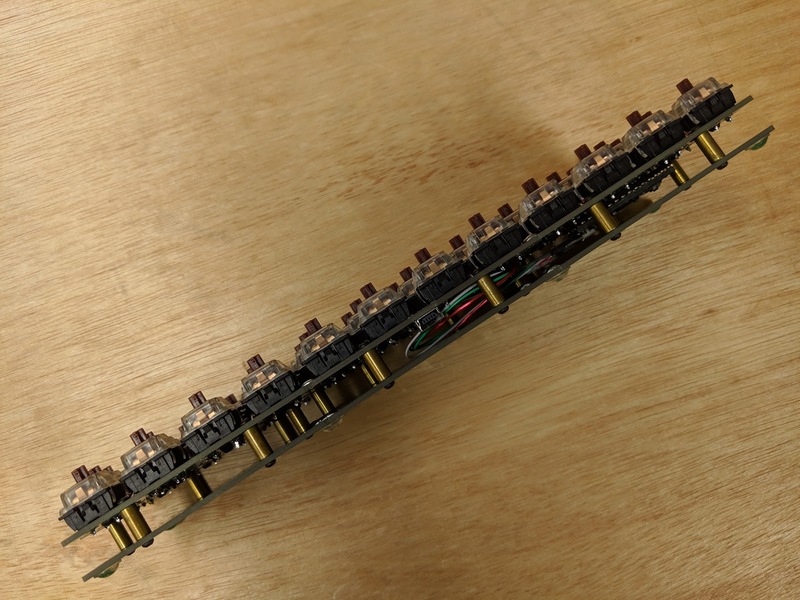 There are no PS2/Serial/USB connectors. 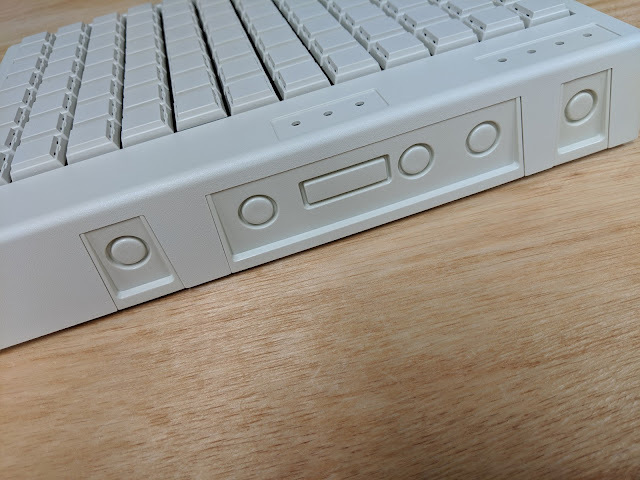 It came with relegendable keycaps. The clear tops were included. 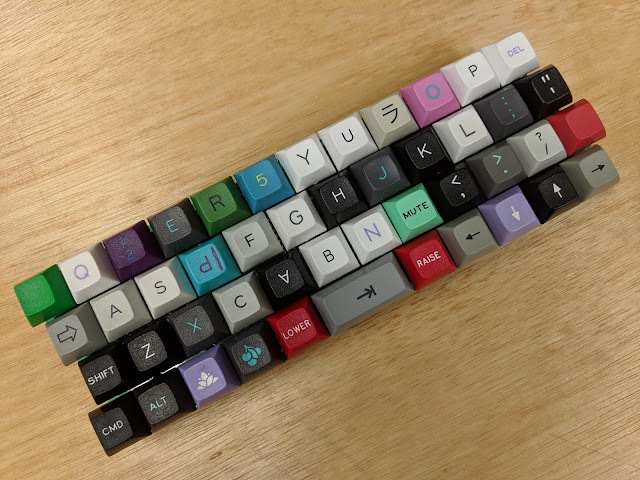 The keycaps alone were probably worth the price. The case is ABS plastic. The bottom is a solid steel plate held on with 8 self tapping screws. 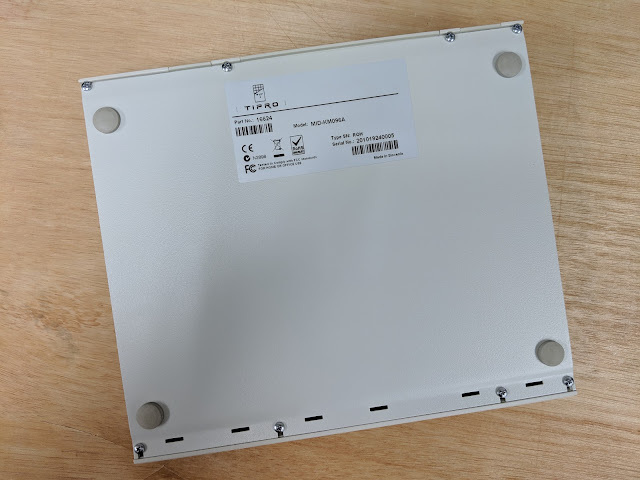 TIPRO MID-KM096A. 9 years old. There are knockouts on the back panel. Should be easy to modify for a connector. The LED indicators have no covers. 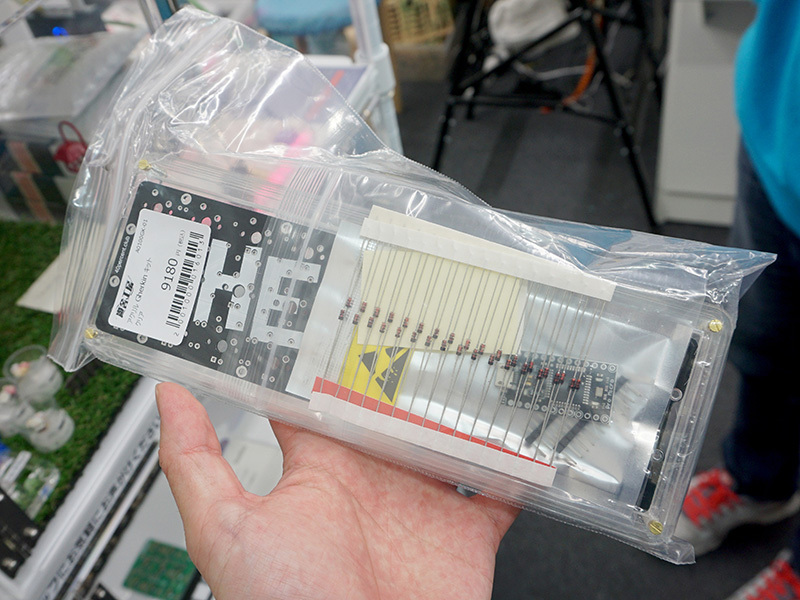 The sides of the case are open and expose the PCB. 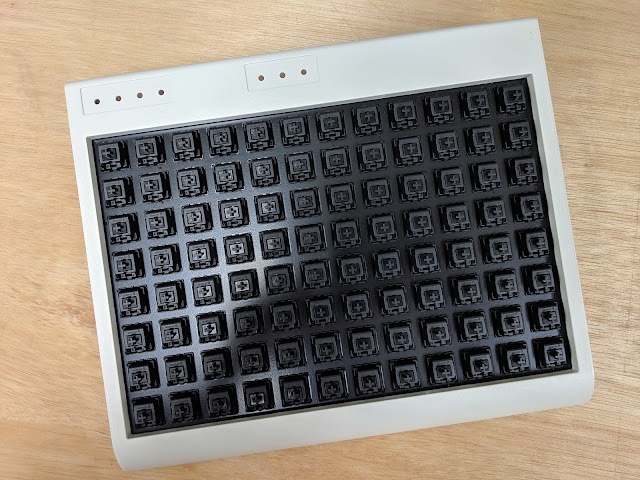 96 Cherry MX Black switches in a powder coated steel plate. The steel plate is held in place with screws across the top and bottom. 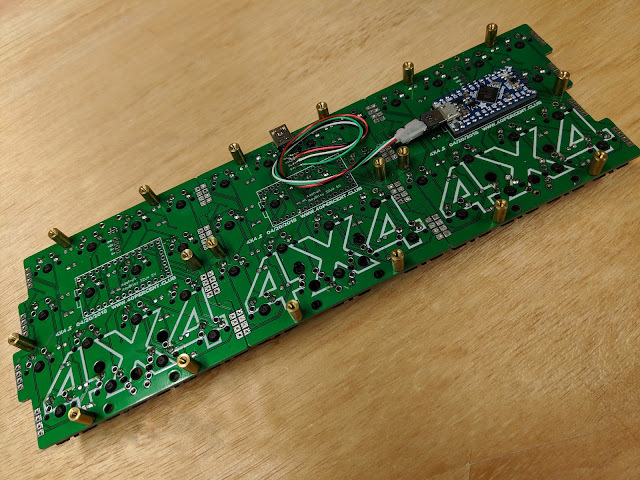 There is an ATmega8515 controller and a 74HC4051D multiplexer. The ATmega8515 has only 8KB of flash. Very little compared to the ATmega32U4 (32KB). Tempted to map out the existing matrix, but since it has no diodes it can not support NKRO so it is probably not worth the effort. 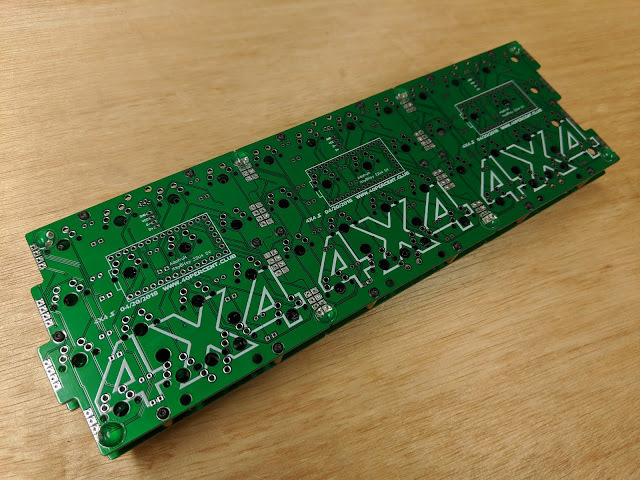 I will probably remove the PCB and replace it with 4x4 PCBs. Two rows of 3. 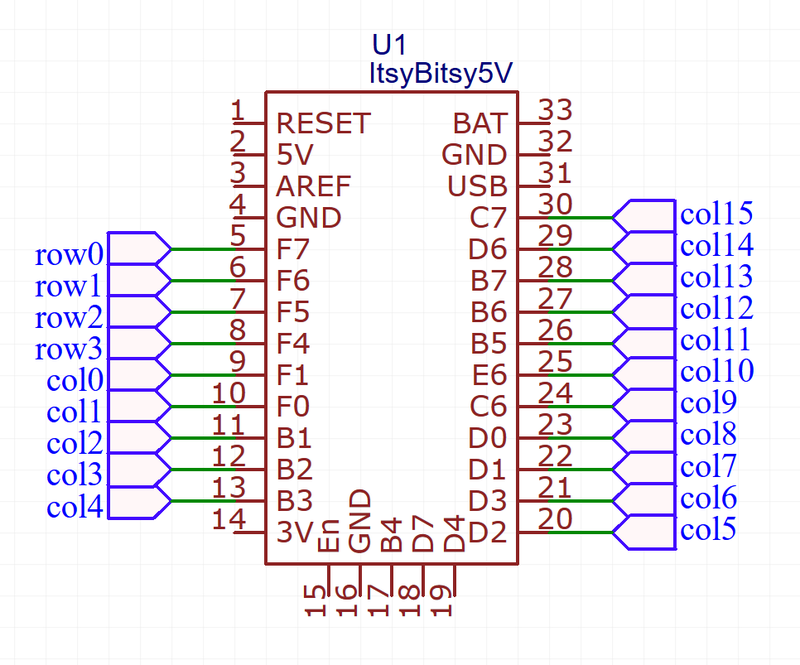 The columns can be bridged between the two sets and the extra data pins used to connect the bottom 4 rows. Unlike the few other Kickstarter projects I participated in, this one delivered on time. 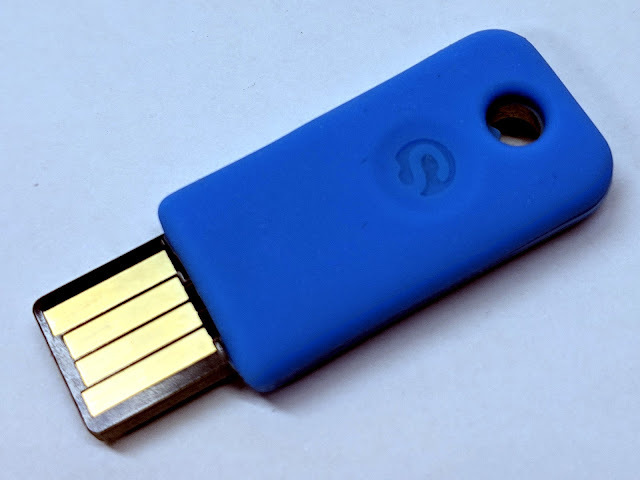 This is a FIDO2 U2F key for 2 Factor authentication. I got the 3 pack of regular USB A keys. 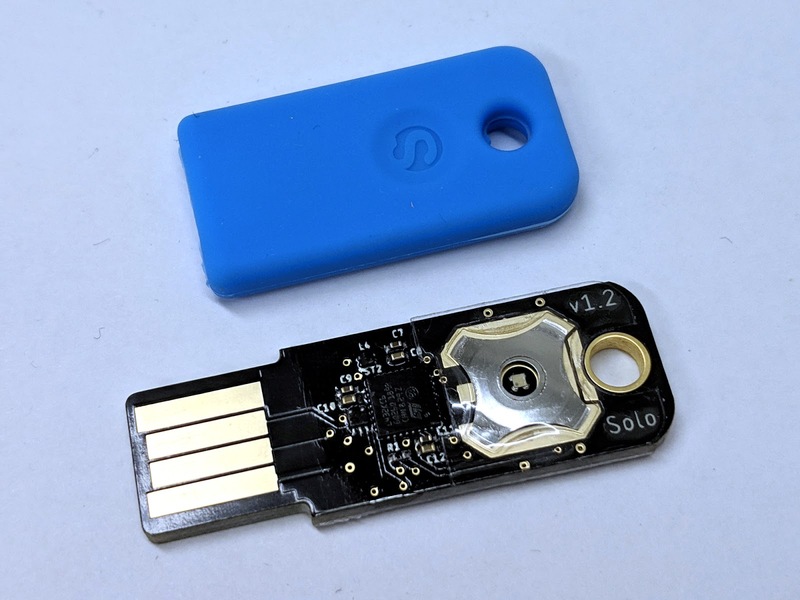 There is also a USB C version and a NFC version. They each came with a random color silicone boot and also a single pack of additional boots in red, green, blue, black and white. Blue boot with the bare Solokey. That's a little RGB LED in the middle of the switch. It lights up through the silicone, it's visible, even through the black boot. Back side of the Solokey. They also have a hacker version that you can customize the firmware on. This is a regular model, and has a bootloader that allows updating the firmware with signed images over USB. More info on their github page. With the silicone boot installed. It's a tight fit. I would not plan to switch boot colors once you have one of these installed. 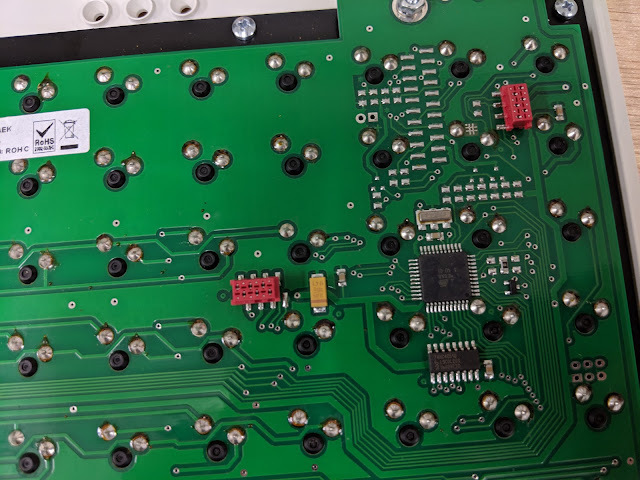 Bare PCB next to the original U2F Zero. The Solokey PCB is 2mm thick. It fits very snugly in a USB port. 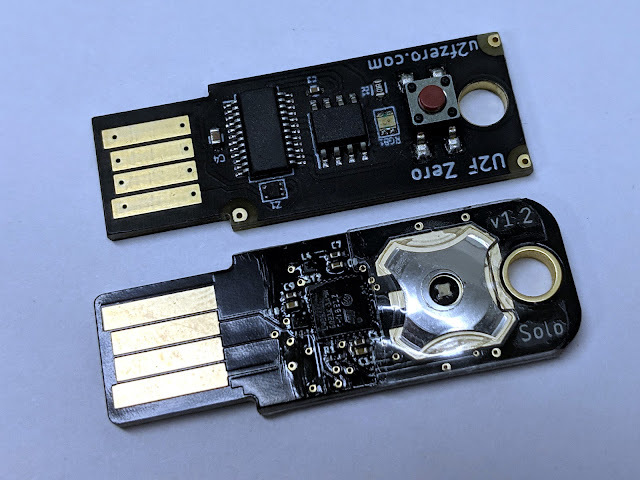 The U2F Zero had a 1.5mm PCB and wobbles a bit. I'll probably get a few NFC ones once they are available. You can pre-order them here. One of my new projects is to make a steno keyboard based on the type of high resistance circuitry the Makey Makey uses. 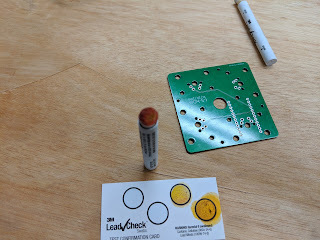 I usually have PCBs made using the cheapest finishing option, leaded HASL. 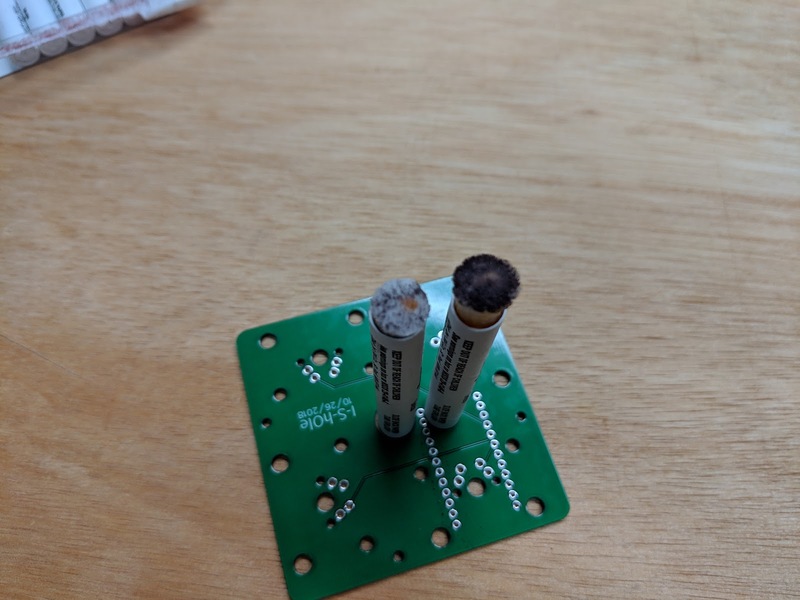 HASL is Hot Air Solder Leveling, essentially a layer of solder coats the copper traces. Copper is reactive and will corrode if left exposed to the air, the solder protects it. Since this project will have fingers in physical contact with the HASL coating I chose the Lead Free HASL option. It was only a few dollars more. 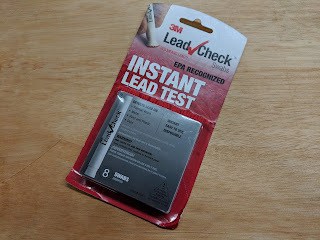 I used a 3M test to see if it contained lead. 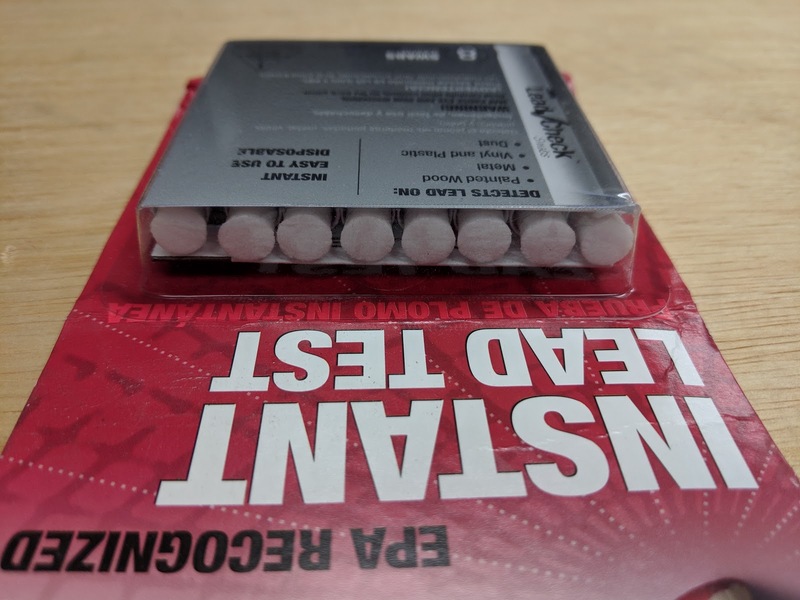 I bought the 8 pack from Amazon. The reviews on Amazon were mixed. It can produce false positives. The only good result is a negative result which would indicate that there is no lead, a positive result may not mean lead is present. It is a cardboard tube with a plastic tube inside. 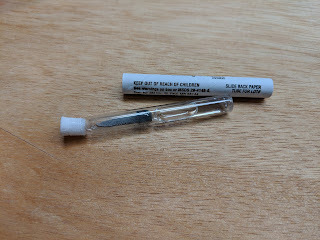 The tube has 2 glass vials that are broken when you squeeze the tube (you aren't supposed to take it apart like I did.) Then you squeeze the mixed liquid out the white fibrous tip. The 8 pack also came with 2 test cards. (One shown here.) This is to verify the test worked by triggering the lead reaction. In short, it didn't work. Whatever the chemical reacts with turned it dark brown immediately on contact with the lead free HASL. So the test is useless in this application. If it remained white then there would be no lead. 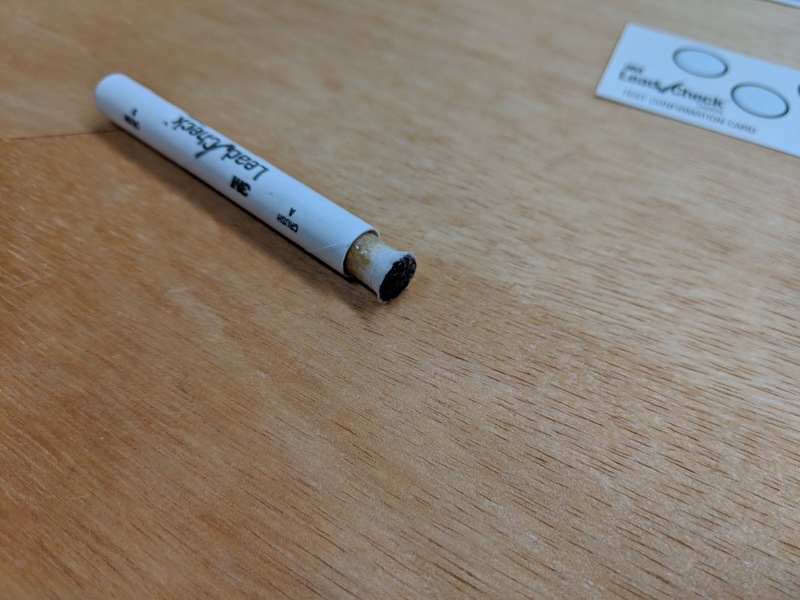 If it turned light pink, there might be lead. Turning dark brown is not something it is supposed to do. I did another test on a leaded HASL PCB and it did turn pink (hard to see but it is a light pink.) So the test does detect the lead in that PCB, which definitely does have lead. Next to it in the picture is the dark brown test from the lead free HASL test. 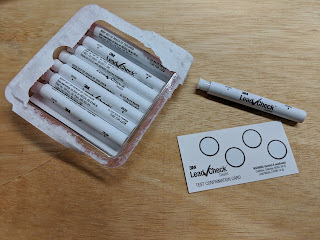 Using the verification card the leaded HASL turned a uniform reddish color, as is should. 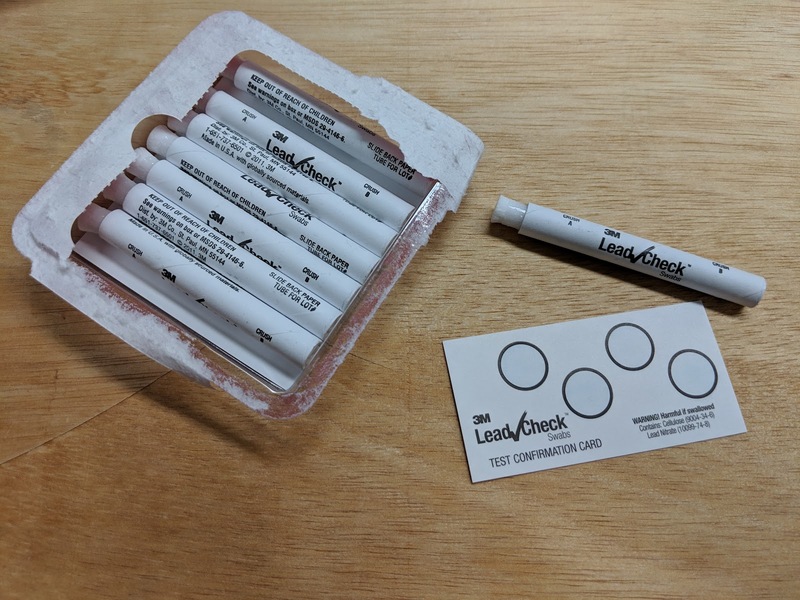 The brown lead free test was already so dark I couldn't see a difference after using the verification card. So, is the lead free HASL really lead free? Probably, but this test can't prove it. 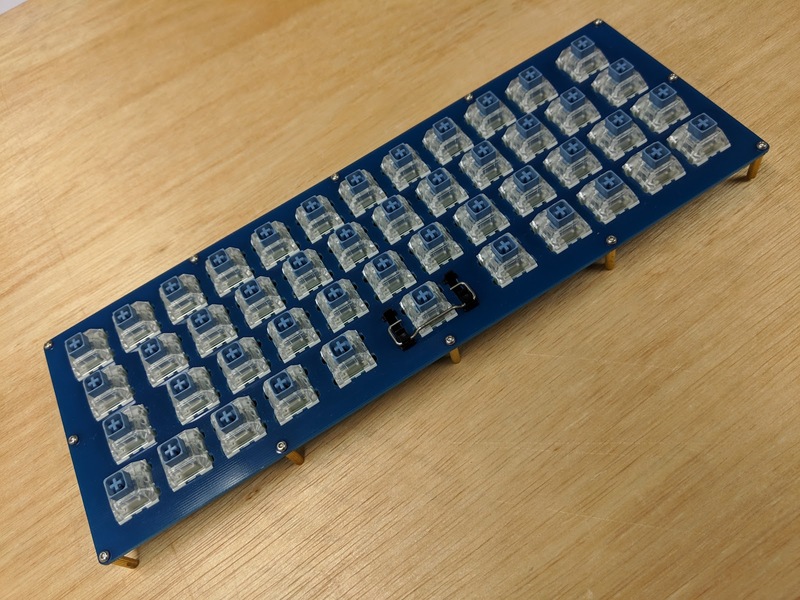 I think I will splurge on a ENIG PCB on my next version of the steno board. 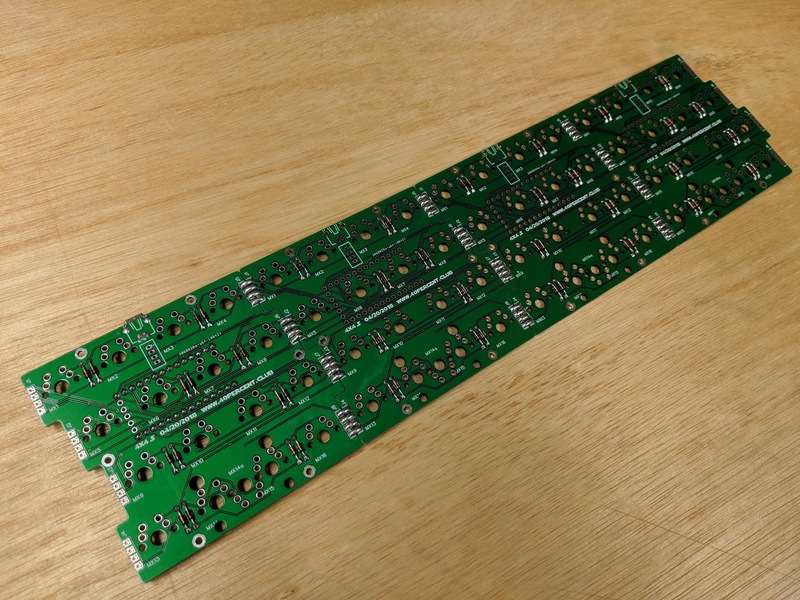 JLCPCB has special pricing for boards this size or smaller. $2 for 10 pieces with green soldermask. $5 for each additional small design in the same order. Shipping will be the largest part of the cost. Adding a small board to an existing order will only increase the shipping cost a few dollars. Until recently, if you chose any color other than green the price would revert to the non-100mm special price. 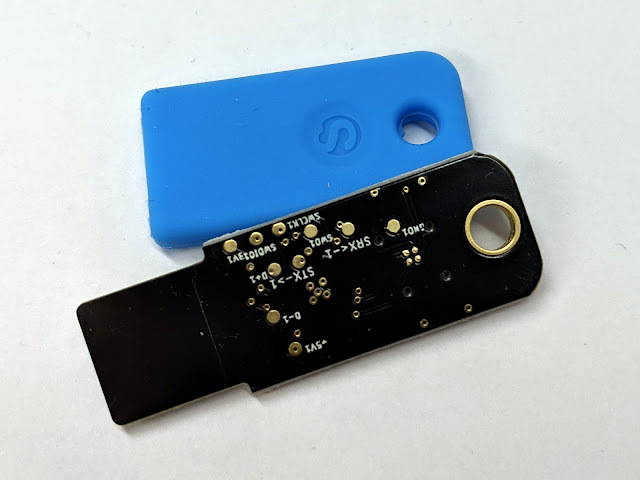 Now you can add color and just pay the additional fee for the colored solder mask. You can also combine shipping if your previous order is still in production. 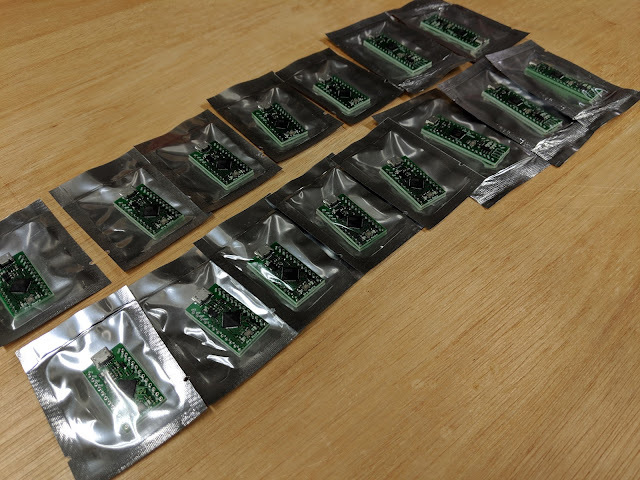 The shipping for the additional boards from the new order will be combined with the previous order and will be much less than shipping a separate new order. I have done this twice to the same order.